What does the 'rare' Black Moon look like? Nothing! What does the rare black moon look like? Nothing! First of all, I'm not going to do what all the other black moon articles do, and I'll tell you the most important piece of information first: You can't see a black moon. No really, you can't see it, it's literally not going to be visible. 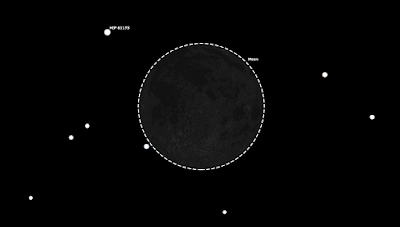 A black moon is the 2nd new moon in the same month, and a new moon is not observable. For all intents and purposes it might as well be invisible. Don't worry about waiting up for the rare black moon to appear because it won't. Also, since the black moon occurs at 8:11pm ET on Friday, September 30, 2016 the moon and the sun will both be below the western horizon (at least from my location here in Indiana). 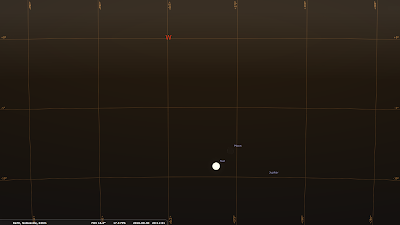 For those in other areas, the new moon is always right next to the sun so you can't see it anyway. 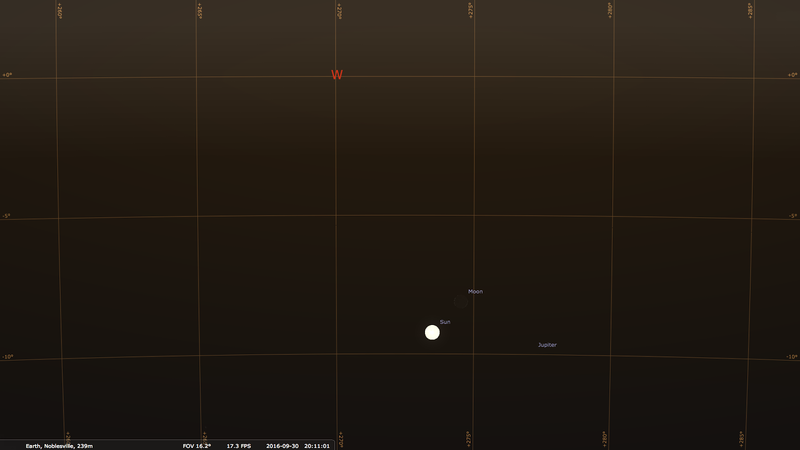 Looking at this diagram from Stellarium, the black moon will be well below the horizon from Indiana at 8:11pm ET. In other areas, the moon will be obscured by the sun, and lit from behind so there's really nothing to see. A new moon happens when the moon and the sun are on the same side of the earth. The far side of the moon is lit, and the side facing Earth is completely dark. Not to mention, the Moon is so close to the Sun that the light will completely obscure the moon. 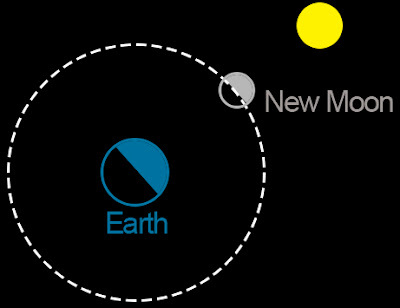 The only way to see a new moon from Earth is during a solar eclipse where the moon passes in front of the disc of the sun. 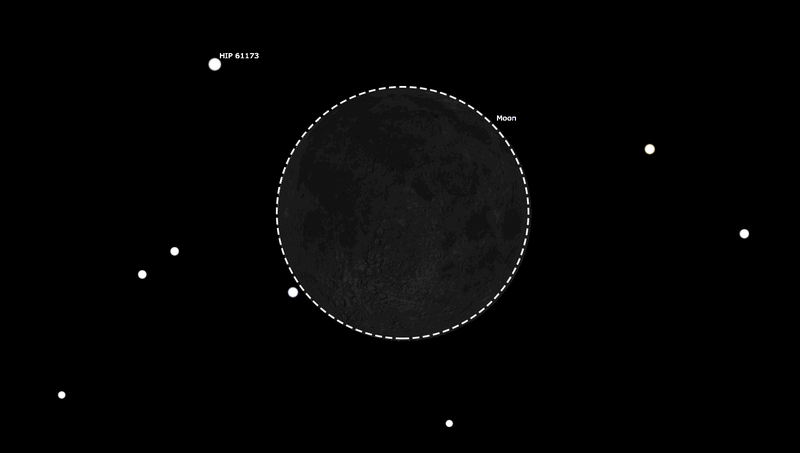 Now, the day before or the day after it might be possible to see a very very slim crescent moon, which is really cool, but this technically isn't a new moon anymore. Speaking of moon phases, check out my composite of moon phase photos that took me 3 months to photograph. So what is a black moon anyway? Apparently it's the 2nd new moon in a calendar month (sort of like a blue moon's invisible friend). From what I can tell, it's another in a long line of terms local news anchors borrow from astrology or the Farmer's Almanac and report it as a rare celestial event - when in fact there is no such term in astronomy, nor do these events warrant special acclaim or attention. "Most people want something in the sky to be special and unique to their lifetime on Earth, an Earth that has been here for 4 1/2 billion years, so this is evidence of a delusional state." Neil continues "Something can be rare but uninteresting, because of how common its rarity is." At least with a Blue Moon or Hunter's Moon or Strawberry Moon you have something to look at! This is a new low for celebrating meaningless moon phenomena because you can't even observe it! So there you have it! Enjoy the blackness of the night sky without light from the moon just like every other month, or any other night before the moon rises or after the moon sets.